The Port is fully compliant with all Marine Security Rules and Regulations as outlined by Transport Canada. 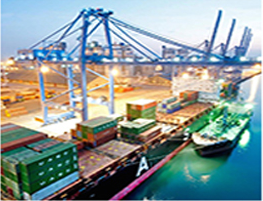 The Port has Marsec Security Level signs in 2 locations, the Steel Dock and the Export Dock. The Port of Algoma perimeter and terminals are fenced in and under constant surveillance. Emergency Services Response Officers are trained to provide medical, fire and security response in order to protect people and goods 24 hours a day, seven days a week. Only Authorized Personnel are allowed access to the Port of Algoma and must have a proper access badge in order to enter a restricted area on the dock. Access and Restricted Area passes are issued by the Marine Facility Security Officer. All ships calling at the Port of Algoma are required to complete a Declaration of Security and a Notification of Arrival prior to interface.